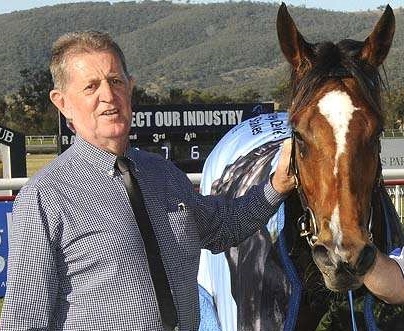 The racing industry is mourning the loss of popular bookmaker, racehorse owner and passionate racing fan, Arnie Bowden. 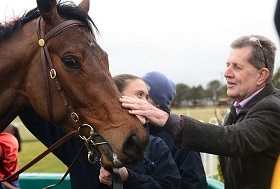 Arnie gives Full View a pat after a win at Goulburn. Credit: Bradley Photos. He passed away on Monday, aged 69, after a short but brave battle with Motor Neurone Disease.Arnie began clerking for other bookmakers as a young man and was granted his own licence in 1982. He was a regular bookmaker at Kembla Grange for thirty years and also enjoyed working at Nowra and Bong Bong Picnic Races. Arnie’s son Matt began working with him as soon as he was old enough to and his now daughter-in-law Katy also penciled for him. “Dad’s love of racing rubbed off on us and I have fond memories of sitting on a picnic blanket at the races with him and listening to broadcasts on 2KY when we weren’t at the track,” Matt said. Arnie was also a teacher for more than three decades and ran a successful IT business, but racing was his passion. He owned horses with Terry Robinson, Robert and Luke Price, Barbara Joseph and Paul Jones, David Pfieffer, Emma and Lucy Longmire and more. Arnie and Atmospherical after her Denise's Joy Stakes win. Credit: Bradley Photos. While he delighted in supporting all his horses and followed them around the country, his best was the David Pfieffer-trained Atmospherical - a great sprinting mare who won the Listed Denise’s Joy Stakes and Earl Grey Stakes and notched several black type placings. Selfless even in his final days, Arnie requested anyone who could make a donation to the MND Research Unit at Macquarie University, led by Professor Dominic Rowe. Information on Macquarie’s MND Research Unit can be found here. Arnie is survived by his wife Sandy, daughter Melanie and son Matt. Racing NSW extends deep sympathy to everyone who knew and loved Arnie.